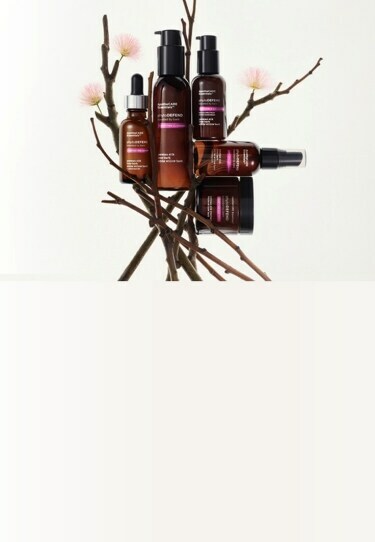 Formulated with Persian Silk Tree Bark and White Willow Bark, the PhytoDEFEND collection captures the essence of the shield of the plant – the bark – into advanced formulas and includes products that help skin defend against everyday aggressors like pollution and fatigue. This collection works with your skin’s surface proteins and minimizes damage from daily pollutants, while restoring vitality to even the most tired skin. The Clay mask draws out impurities while the Niacinamide serum defends against dull skin and helps defend against skin fatigue from artificial blue light. Included at an active level in our products like the Serum and Anti-Pollution Spray, Persian Silk Tree Bark helps to visibly reduce signs of skin fatigue, so skin looks refreshed and energized. The Persian Silk Tree is native to Asia, from Japan to Iran. It typically grows in a vase shape with fluffy, pink, powder-puff flowers. Persian Silk Bark is renowned for visibly reducing the signs of skin fatigue while defending against skin damage.